Talks with North Korea have rarely been out of the news in recent months. While much of these dealings can be questioned, at least one outcome is now essentially beyond reasonable doubt. North Korean leader Kim Jong-un pledged to dismantle North Korea’s main rocket engine test site during his Singapore summit with US President Donald Trump – and it looks to be happening. In the weeks immediately following the summit, boffins noted there was no evidence that anything had changed at the test facility. The site is located at the Sohae space launch centre on North Korea’s west coast, which has been used for most of North Korea’s satellite launch attempts. Like the rest of the Sohae centre, the site is heavily monitored by satellite paparazzi. To be fair, the North Koreans did not give any timetables or deadlines for when the site would be decommissioned. But satellite photography has now observed the dismantling in action. Most quality satellite observations of North Korea openly published come from the US-based website 38 North, which taps a group of seasoned professionals to interpret the images. High-resolution satellite imagery has been commercially available since 1999, but most media groups and think tanks are not equipped to use it effectively by themselves. Thus, most public channels depend on a “satellite spoon-feed” from an expert group, where imagery and interpretation are supplied in a package. The latest spread from 38 North shows undeniable evidence that the test site is being dismantled, and the process could be complete in a matter of weeks. Sometimes, it takes a lot of expertise to interpret satellite imagery, but the dismantling of this infrastructure is so obvious that lay observers can draw their own conclusions from some of the images. The dismantling of the Sohae test stand is a textbook example of the power of satellite imagery as a verification tool in international affairs. Some of North Korea’s confidence-building moves have not really generated much confidence for international observers. 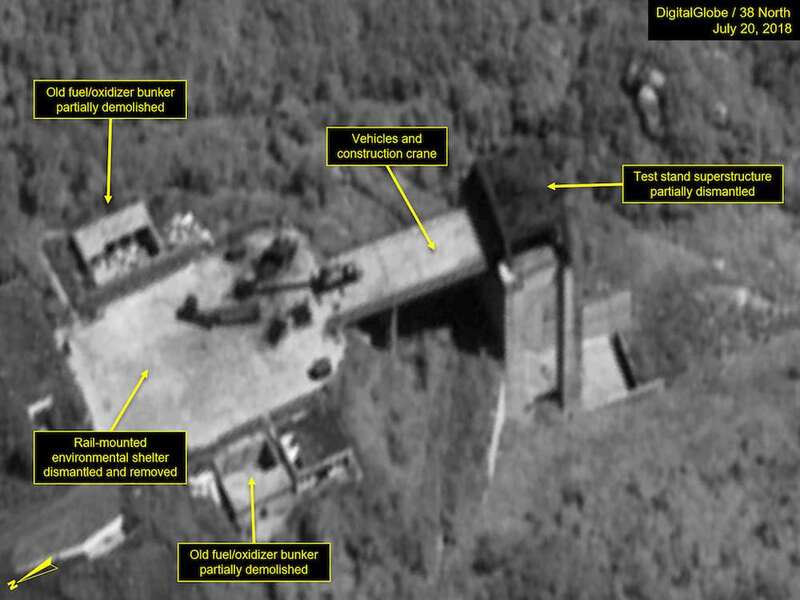 The demolition of North Korea’s nuclear test site, for example, has not been verified to complete satisfaction, as observers were unable to access or remotely observe the condition of the underground tunnels at the site. But the rocket engine test stand operates under different conditions, and is much easier to check. Curiously, demolition of the engine test stand has begun without prior notice of the time, and without media being invited. It has involved mundane demolition methods instead of the theatrical explosions (even of wooden shacks) that entertained the media pack at the nuclear test site. Perhaps North Korea feels that space voyeurism is enough to get the message across this time. Or perhaps they were dissatisfied with the reaction to the last media event. Whatever the strategy, this is one occasion when seeing is believing in terms of North Korean monitoring and verification.